Another article underlining the potential for gold stocks to catch-up to this year's rise in the price of gold. Long term this is quite true and virtually inevitable in my opinion. When it will happen is the only question. This not to say that gold will not continue to correct. Indeed the continuing divergence in gold equities may indicate further selling. As an investor it is clear we are seeing continuing opportunity to accumulate gold stocks. Gaining the greatest leverage for the return of the uptrend in gold equities is, for me, to be found in junior gold stocks with assets—especially those ones still in the penny to two dollar range. See my recent picks in the 'Gold' tab above. The gold mining business has been a tough industry for investors over the last couple of years, despite skyrocketing gold prices. Gold has outperformed most other asset classes but the mining shares have not kept up with gold’s performance. There are many theories why the shares are lagging behind, some say that frightened investors prefer the safety of gold bullion, and others say that newly launched gold derivatives and ETFs has been competing with the shares for capital. Until recently, many gold equities had been in a multiyear trading range with flat stock performance despite increasing revenues and substantially higher profits. The gold bugs index (HUI) is a good benchmark to see whether gold stocks in general are outperforming or underperforming gold. It is composed of the 16 largest and most widely held public gold production companies. 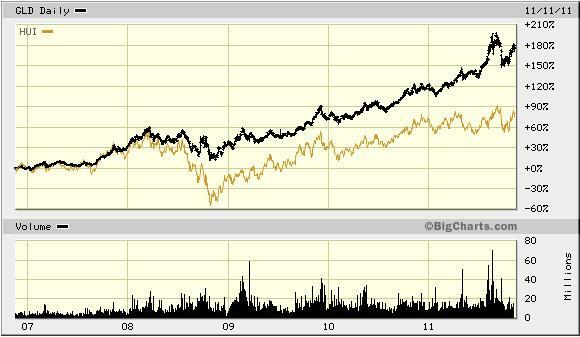 The chart below compares gold’s (GLD) performance against the HUI. Both gold and the HUI were neck-to-neck until the financial crisis of 2008, when gold pulled away. 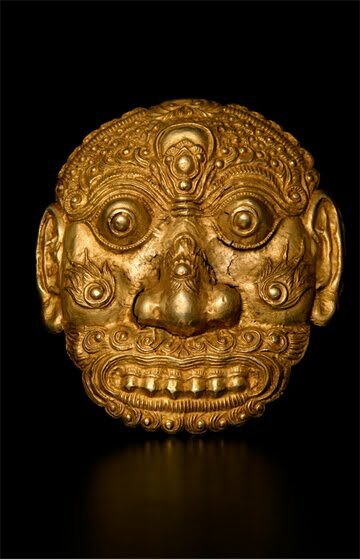 Until this day gold has been a far better investment than most gold stocks. Although the shares have been lagging behind, there are a number of developments that suggest that the mining companies might be ready to catch up and outperform physical gold and silver. First, margins between the gold price and cash costs of production per ounce have been growing steadily. This has led to vastly increased profitability. The increase in margins has been a result of higher gold prices as production cost has been increasing at a much lower rate. 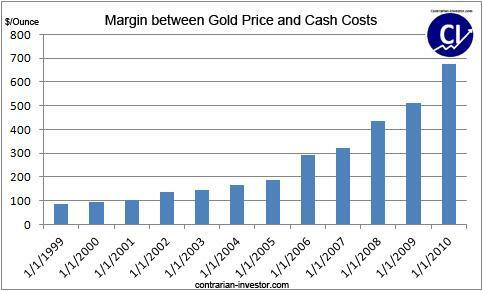 This chart below shows the average industry margins between the gold price and cash costs of production per ounce. 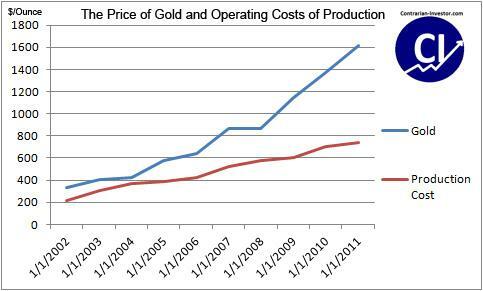 The next chart compares the price of gold and the operating costs of production. The price of gold has been increasing at a much higher rate than the production cost and as long as gold remains at present levels the gold mining companies will remain highly profitable.